The Yankee Institute for Public Policy has published a report claiming that compensation for public-sector workers in Connecticut is 25 percent to 46 percent higher than for comparable workers in the private sector. The report was written in 2015 by Andrew Biggs, a resident scholar at the American Enterprise Institute. His findings are at odds with careful research finding that public-sector workers typically receive compensation lower than or equal to comparable private-sector workers, with lower salaries partly or fully offset by better benefits (Allegretto and Mishel 2016; Bender and Heywood 2010; Keefe 2010; Munnell et al. 2011; Schmitt 2010). Biggs’s findings are based on a cherry-picked sample of workers. Biggs excludes the pay of an estimated 82 percent of state and local government workers in Connecticut, notably that of all public school teachers and local government employees. Since teachers are the largest group of public-sector workers and earn significantly less than similarly credentialed private-sector workers, this exclusion boosts the relative pay of public-sector workers in his sample. Biggs also excludes public safety personnel despite including some of their relatively generous retirement benefits in later benefit comparisons. Even with this cherry-picked sample, Biggs finds that full-time, full-year public-sector workers in Connecticut are paid about 8 percent less on average than full-time, full-year private-sector workers: $70,970 vs. $77,363. Biggs uses nonstandard control variables to eliminate the remaining pay penalty for public-sector workers. Biggs claims to use a “human capital” model that compares the pay of workers with similar potential productivity. Since public-sector workers are better educated than private-sector workers, we might expect such an apples-to-apples comparison to result in a larger estimated gap between public- and private-sector workers’ pay. Instead, Biggs manages to eliminate the gap entirely. He does this by selectively controlling for a number of factors that have no direct bearing on workers’ productivity but could influence pay through patterns of discrimination or sorting. He also includes control variables that tend to be associated with a particular sector, such as having an undergraduate business degree. Though control variables are supposed to be predetermined factors, many students decide on public- or private-sector careers before choosing their undergraduate majors. These potentially “bad controls” drive much of his unexpected results. Last but not least, Biggs inflates the cost of retiree benefits in the public sector while minimizing their cost in the private sector. Among other things, Biggs exaggerates the cost of pension benefits by basing them on unrealistically low rates of return on pension fund assets. Adding in these inflated benefits allows Biggs to show a 25 percent to 46 percent public-sector pay premium. Workers without college degrees are compensated somewhat more in the public sector than in the private sector, whereas those with college and graduate degrees are compensated somewhat less. This is true even when factoring in the more generous benefits in the public sector. The lower compensation of college-educated workers in the public sector offsets the higher compensation of those with less education. As a result, taxpayers are not overpaying for public services, while still ensuring a decent standard of living for less educated workers. Cutting public-sector benefits to make compensation more competitive, as Biggs suggests, would make compensation even less competitive for college-educated workers. Meanwhile, it would shift health care and other living expenses of less educated workers onto government safety net programs, whose costs would be picked up by the same taxpayers Biggs claims to want to shield. Though the title of his report refers to “public vs. private-sector compensation,” Biggs’s findings are based on a small and unrepresentative sample of the public-sector workforce in Connecticut, excluding teachers, police officers, and firefighters as well as all local government employees. To make matters worse, he claims to exclude public safety personnel because they receive different benefits, yet includes some of their relatively generous retirement benefits in benefit comparisons. Biggs also drops the second-largest occupational group in the public sector—public safety officers (McNichol 2012). He explains his decision to drop teachers, police officers, and firefighters as due to the “unique characteristics of their professions,” meaning that there are no workers with comparable jobs in the private sector. But there is often little overlap between other public- and private-sector occupations so this problem is not limited to these two groups. Because they are a large part of the public-sector workforce and because their pay lags similarly credentialed private-sector workers, dropping teachers will reliably boost the pay of public-sector workers in Biggs’s sample relative to that of private-sector workers. Police and firefighters, meanwhile, have relatively modest base salaries balanced by generous retirement benefits (due in part to the physical and stressful demands of their jobs). While Biggs drops public safety officers from his salary and wage comparison, he includes their generous benefits in some of the statistics he cites when comparing public- and private-sector benefits. Even with his cherry-picked sample, Biggs finds that full-time, full-year public-sector workers in Connecticut are paid about 8 percent less on average than their private-sector counterparts: $70,970 vs. $77,363. Control variables are explanatory variables added to statistical models to control for other factors (such as education), that affect the outcome variable (in this case, pay) in addition to the explanatory variable of interest (in this case, sector).5 The effect is similar to grouping workers by educational attainment before comparing pay across sectors, but a multivariate regression analysis is more manageable when there are additional explanatory variables (such as experience) or when these variables can take on many values. Controlling for education and experience is likely to change the estimated effect of public-sector employment on pay. In fact, that is the point—to focus on the difference in pay for equally skilled workers rather than simply the average difference in pay between the two groups of workers. Omitting education or experience would result in a biased estimate of the effect of public-sector employment on pay. However, not every control variable that might be useful in predicting pay should be included in a model that attempts to measure differences in pay for equally productive workers, as Biggs claims to do with his “human capital” model. For example, a variable ranking workers’ occupations by the share of women employed in those occupations might be useful in predicting workers’ pay since workers employed in female-dominated occupations such as teaching tend to be paid less. However, this has little or no bearing on a worker’s potential productivity and so in this case including (rather than omitting) an explanatory variable will result in a biased estimate of the difference in pay between equally skilled public- and private-sector workers. As noted above, prior to performing his regression analysis, Biggs finds that full-time, full-year public-sector workers in Connecticut are paid about 8 percent less on average than their private-sector counterparts. Given that public-sector workers have more education and experience, we would expect that a comparison of workers with “similar levels of education, experience and other earnings-related attributes” (as Biggs describes his methodology) would find an even larger gap between public- and private-sector workers after taking these differences into account. Instead, Biggs claims to find no difference at all between public- and private-sector pay after controlling for a long list of factors that do not necessarily reflect productivity differences between the two groups of workers. Biggs claims to be estimating a pure “human capital” model of wage determination, controlling for characteristics that reflect productivity differences across workers. Education and potential experience are two obvious, and relatively noncontroversial, human capital controls. However Biggs also includes demographic characteristics such as gender and race. Because public-sector employers hire more black and female workers than private-sector employers, and because these workers are paid less than similarly qualified workers (Gould, Schieder, and Geier 2016; Wilson and Rodgers 2016), including these variables will have the effect of shrinking—or potentially even reversing—the estimated public-sector pay penalty, even though it is likely that some or all of the lower pay experienced by black and female workers is driven by discrimination or other factors unrelated to productivity. Though it is often assumed that adding control variables always improves a statistical model, this depends on the variables and the question being asked. In this case, the goal is to compare the pay of equally productive workers in two sectors, so it is clearly necessary to control for differences in measures of human capital such as years of education and potential work experience. Control variables are also needed to adjust measures of pay and work to ensure they are measured consistently—adjusting for differences in work hours, for example.7 However, additional control variables will bias the results if these variables are correlated with sector and pay but have little or nothing to do with workers’ productivity (see Appendix A: How adding control variables can bias results). Biases can add up with the inclusion of more variables that are positively correlated with public-sector employment and negatively correlated with pay, or negatively correlated with public-sector employment and positively correlated with pay. This includes not just demographic variables but also variables associated with occupations. It might seem obvious that undergraduate business degrees are worth more than, say, degrees in public affairs or public policy. However, the extent to which corporate jobs pay more or less than government jobs is what we are trying to measure, not something that should be subtracted from the equation. There is, admittedly, no perfect way to compare teachers, tax auditors, police officers, and toll collectors with business managers, financial advisors, construction workers, and hairdressers—or any number of other occupations associated with one or the other sector. While different occupations may be viewed as more or less skilled, controlling for occupation adjusts for all pay differences between jobs whether related to skill or not. At best, controlling for occupation and for variables closely tied to occupation limits the analysis to pay differences within occupations (say, administrative assistants in government agencies compared with those in insurance firms), when we are also interested in differences between occupations—that is, between equally skilled workers in predominantly public- and private-sector occupations (for example, tax auditors compared with financial advisors). Controlling for occupation and degree field might be an attempt to control for any unobserved differences in the skill level required for different occupations, but it will also control for differences in pay that have nothing to do with human capital. At worst, occupation and degree field may be what econometricians Joshua Angrist and Jörn-Steffen Pischke dubbed “bad controls” because they may be viewed as outcomes of the variable of interest—in this case, sector (Angrist and Pischke 2009). Though the choice of degree field may appear to predate the choice of occupation and sector, students often choose college majors with an eye toward future careers in the public or private sector. If the public-sector pay penalty is a measure of workers’ willingness to pursue public service careers despite lower pay, the result of adding occupation and closely related variables will not just be a conservative estimate of the difference between public- and private-sector pay (conditional on occupation), but something murkier with no clear causal interpretation because degree field and occupational group can themselves be outcomes of the variable of interest—the willingness of public-sector workers to work for less. This is not to say that there is no public-sector pay gap within occupations as well, as can be seen if we focus on occupations in which there is significant public- and private-sector employment. Figure A compares public- and private-sector pay for all occupations with an average of 1,000 or more public-sector workers in Connecticut in 2009–2013 and in which there is at least one private-sector worker for every two public-sector workers (author’s analysis of American Community Survey data). *Not including judicial law clerks, paralegals, legal assistants, and miscellaneous legal support workers. While some of these occupational categories are broad and cover a range of responsibilities, there is a clear pattern of public-sector pay being lower for professionals such as managers, accountants, lawyers, and nurses; and higher for blue- and pink-collar workers such as janitors and nursing aides. The exceptions are counselors, social workers, and office supervisors, all of whom are better paid but also much better educated in the public sector (79 percent of public-sector workers in these occupations have a bachelor’s degree or more education, compared with 42 percent of their private-sector counterparts). Biggs is hardly alone in including demographic and other control variables in pay comparisons, but the number and choice of variables he includes and his insistence on interpreting this as a “human capital” model stand out. Generally speaking, the greater the number of variables positively correlated with public-sector employment and negatively correlated with pay (or negatively correlated with public-sector employment and positively correlated with pay), the more the public-sector pay penalty will appear to shrink, especially if factors such as union membership are ignored that would have the opposite effect. Biggs explains that he does not account for union membership because union members’ higher pay may not reflect differences in ability. Though this is defensible in a strict human capital model, the higher pay associated with unionized jobs may motivate workers, allow employers to recruit higher-quality candidates, or reflect skilled-trades training and licensing not captured in the ACS and other surveys (see, for example, Dube, Kaplan, and Thompson 2014). Though Biggs does not control for union membership, he reluctantly adjusts for employer size, another common control variable that will tend to increase the estimated public-sector pay penalty. There are many possible explanations for why larger employers pay better, and the reasons matter if the goal is determining whether compensation is competitive for similarly qualified workers across sectors. Larger firms may pay more because they attract better candidates or use “efficiency wages” as an incentive for harder work, or they may overpay workers but still remain competitive due to economies of scale.11 If the latter explanation is closer to the truth, it would be inappropriate to take establishment size into account in determining whether public-sector workers are overpaid. More likely, however, the pay difference reflects differences in productivity, so the analysis of pay differences by sector in the next section will follow Biggs’s example and compare public-sector workers with workers employed by larger private-sector establishments. However, this must be done with an after-the-fact adjustment since the American Community Survey does not include a variable for firm size. Perhaps the most unusual choice Biggs makes is controlling for where workers live—not just region, state, or even metro area, but a smaller geographic unit called a “Public Use Microdata Area,” or PUMA. This arbitrarily splits even midsized cities such as Hartford into smaller areas without evidence that they are separate labor markets. It is standard to control for region or state when a sample includes workers from around the country, but there are 43 PUMAs in Connecticut, a state small enough that it is possible to commute from one side of the state to the other in two hours. While geography is a predictor of pay due to differences in the cost of living and the fact that workers and firms are not perfectly mobile, some differences are simply due to the fact that, all else being equal, lower-paid workers tend to live in lower-cost neighborhoods. Worse yet from a statistical perspective, lower pay can cause people to move to lower-cost areas, something called reverse causality. Thus, controlling for residential area is a statistical no-no that will tend to shrink the estimated public-sector pay penalty.12 Biggs justifies his inclusion of PUMAs as a way to adjust for differences in the cost of living, but this should be done between regional labor markets, not within them. In short, it is up to researchers to justify the use or omission of control variables, and researchers should err on the side of caution rather than stacking the deck to support their argument, as Biggs does. As discussed in the previous section, Biggs’s results depend on the inclusion of a large number of control variables. The analysis in this section will show that they are not robust to more conventional model specifications. Table 1 shows the results of three sets of regressions estimated on a 5-year (2009–2013) sample of wage and salary earners from the American Community Survey of Connecticut public- and private-sector workers (the same years and survey used by Biggs). Estimates for categorical or “dummy” variables are expressed as the percentage difference in real earnings relative to male, white, non-Hispanic, native-born, private-industry workers. Thus, for example, coefficients in the second regression (“with demographic controls”) show that public-sector workers are paid 9 percent less than private-sector workers, or 14 percent less after adjusting for firm size; women are paid 22 percent less than men; and black workers are paid 15 percent less than white workers. Other rows show the percentage increase in pay associated with an additional year of experience (5 percent), an additional year of education (11 percent), or an additional hour of work per week (2 percent). Sources: Author's analysis of 2009-2013 microdata from the American Community Survey (Ruggles et al. 2015); Biggs (2015). For simplicity and ease of comparison, the analysis follows Biggs’s example in focusing on full-time, full-year workers, even though this has the effect of excluding many public-sector workers employed in education. However, teachers, public safety officers, and local government employees are not specifically excluded from the sample. 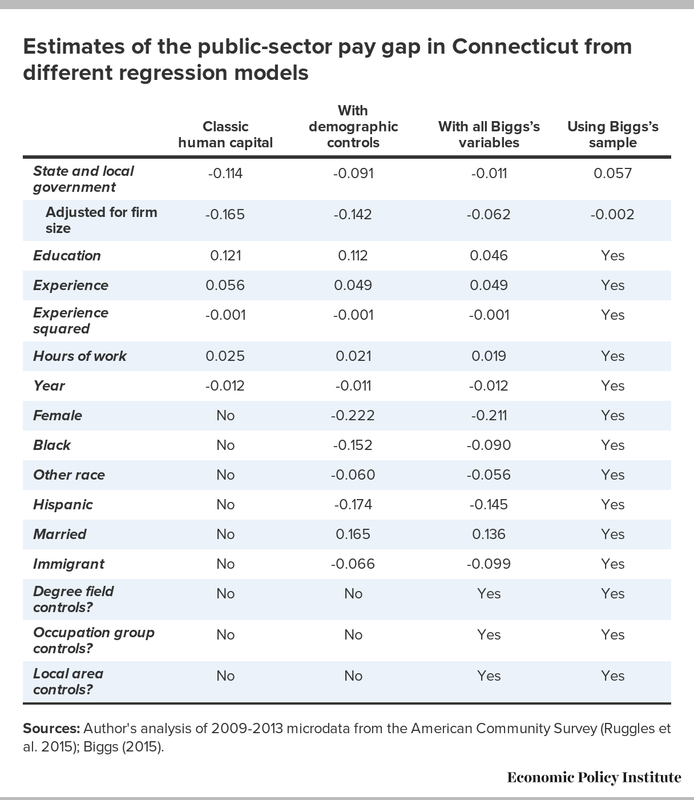 Biggs’s results are shown in the last column for comparison purposes, though he does not report full regression results, only which variables he includes in his model. The first regression is a classic human capital model based on Mincer (1974) and Lemieux (2006) that adjusts only for education, potential work experience, hours worked, and year.13 The second regression adds demographic control variables and is similar to Allegretto and Mishel (2016), Bender and Heywood (2010), Munnell et al. (2011), Schmitt (2010) and many other researchers. The third attempts to replicate Biggs’s methodology but applies it to the same larger sample as the first and second regression analyses (e.g., not excluding local government workers, teachers, and public safety personnel). All results shown are statistically significant at the 5 percent level except the state and local government coefficient in the third regression and some individual degree field and local area control variables. The first regression shows that public-sector workers are paid around 11 percent less on average than private-sector workers after adjusting for education, experience, hours worked, and year. This shrinks to around 9 percent when demographic control variables are added in the second regression. Following Biggs’s example and subtracting 5.1 percentage points to account for employer size, the adjusted pay penalty for working in the public sector grows to around 14 percent with demographic controls and 16 percent without demographic controls (Biggs subtracts 5.9 percentage points using a similar methodology but different sample).14 Continuing across the second row of Table 1 to the third regression and comparing this with Biggs’s results, roughly half of the remaining difference with Biggs is due to the addition of what may be considered “bad controls”—degree field, occupation group, and local area controls. The other half is due to his restricted sample. In short, Biggs’s nonstandard methods and selective sample drive his results. Focusing on the second regression, which provides a conservative but fairly standard measure of the public-sector pay gap, the sample is divided between workers with and without bachelor’s degrees to see if the gap varies by educational attainment (Table 2). The results confirm that workers without bachelor’s degrees are paid more in the public sector (8 percent more) while those with bachelor’s degrees or more education are paid less (22 percent less) as previous research has found. Source: Author's analysis of American Community Survey microdata (Ruggles et al. 2015). These are more straightforward estimates of the gap between public-sector workers and all private-industry workers, and are much less likely to be affected by the problem of independent variables being causally related to the dependent variable. Arguably, an even better comparison group is between public-sector workers and unionized private-industry workers. However, information on union membership is not available in the ACS. Nationwide in 2013, private-industry workers belonging to a union were paid 22 percent more than nonunion workers, though some of this pay differential is due to differences in education and experience already accounted for in these regressions (author’s estimates based on BLS 2014). The pay figures cited above do not include benefits, which are typically more generous in the public sector. Most public-sector occupations are positions of public trust such as school employees, public safety personnel, and transit workers. Public-sector compensation, heavily weighted toward health and retirement benefits, is designed to attract and retain stable employees willing to forgo higher salaries in exchange for financial security in retirement and better insurance against health risks. This compensation structure reduces costs associated with turnover and allows employers to take advantage of workers’ on-the-job experience. Traditional pensions and retiree health benefits also encourage workers to retire at predictable ages. This is particularly important in public safety, where jobs are stressful and physically demanding; and education, where the demand for particular specialties fluctuates and skills may become obsolete (for more on the advantages to employers and taxpayers of public pensions, see Morrissey (2015)). It also makes little sense for public employers to shift health care and other benefit costs onto government programs as some private employers do, since taxpayers pay for the state’s Medicaid, Earned Income Tax Credit, and other safety net programs. However, Biggs estimates that benefit costs for public-sector workers in Connecticut are actually worth much more—from 77 to 107 percent of salaries, depending on the discount rate used to convert the estimated future value of pension benefits to their present value taking into account investment returns. Table 3 compares Biggs’s lower-end estimates of public- and private-sector benefit costs with more realistic estimates. Since Biggs also estimates that wages and salaries are equal across the two sectors (see the discussion of Table 1) and since he estimates that private-sector benefits amount to 41 percent of salaries, he concludes that total compensation is at least 25 percent higher in the public sector. In contrast, using more realistic measures of benefit costs, these are 16 percentage points higher in the public sector, essentially offsetting an estimated pay gap of 14–16 percent from the first and second salary regressions in Table 1. Thus, total compensation is roughly equal in both sectors, rather than much higher in the public sector as Biggs claims. Note: Figures may not sum to totals and subtotals due to rounding. *Biggs's public-sector estimates are based on unpublished BLS statistics except his estimates for health insurance, defined benefit pensions, and retiree health benefits, shown in bold. The health insurance estimate is based on the 2013 cost reported in MacArthur Foundation and Pew Charitable Trusts (2014), divided by Biggs's estimate of the average public employee salary between 2009-2013. The defined-benefit pension cost is based on the normal cost in 2013-14 for participants in the State Employees Retirement System (Cavanaugh Macdonald Consulting 2014), adjusted for a discount rate of 5 percent. The retiree health cost is the normal cost for state employees in 2013-14 (Segal Consulting 2014). **EPI's public-sector estimates are 2009-2013 averages of published BLS statistics for state and local government workers nationwide, including supplemental pay in wages and salaries instead of benefits, except for defined-benefit pensions, retiree health benefits, and Social Security (shown in bold). Defined-benefit pension costs are based on the weighted average normal cost for participants in the Connecticut State Employee Retirement System and the Municipal Employee Retirement System in 2013-14, based on actuarial valuations (Buck Consultants 2012 and Cavanaugh Macdonald Consulting 2012). Retiree health costs are the normal cost based on the 2013-14 actuarial valuation (Segal Consulting 2014), with earlier years assumed equal to 2011-12. The Social Security cost is adjusted for municipal employees not covered by Social Security (author’s estimate based on Buck Consultants 2012 and Cavanaugh Macdonald Consulting 2012). Source: Published (EPI) and unpublished (Biggs) Bureau of Labor Statistics “Employer Costs for Employee Compensation” statistics, except as noted in text (exceptions shown in bold). What explains these vastly different results? For most types of benefits, Biggs uses Employer Costs for Employer Compensation (ECEC) statistics from the Bureau of Labor Statistics that are not much different than the BLS statistics used for the EPI estimates in the table. Biggs obtained unpublished BLS statistics for private-industry workers employed by large employers in New England, but apparently used published BLS statistics for public-sector workers in the region, including local government employees excluded from his salary comparison. The big differences are his use of non-BLS statistics for pensions, which he inflates by a factor of three to seven by using lower discount rates than those used by pension fund actuaries, and his addition of retiree health benefits, which are not included in ECEC measures for active employees. Though there are legitimate reasons to adjust pension benefits and to include retiree health care, Biggs places his thumb heavily on one side of the scale, as will be explained in detail in the next two sections. Biggs does not mention that 28 percent of state and local government workers in Connecticut are not covered by Social Security (Nuschler, Shelton, and Topoleski 2011). Though some are teachers who may not be included in our full-year sample, even among other state and local government employees in Connecticut, nearly one in five are not covered by Social Security (author’s analysis of Buck Consultants 2012 and Cavanaugh Macdonald Consulting 2012). The EPI estimate for public-sector Social Security benefits is adjusted accordingly. BLS measures of employer contributions to traditional “defined-benefit” (DB) pensions can be more or less than the normal cost of benefits accrued in a given year because they may include catch-up payments for employers who neglected past contributions, or, conversely, they may not be the full amount necessary to cover the normal cost of these benefits.17 DB pension contributions also fluctuate depending on market returns. During the period covered in the study, DB pension costs increased substantially due to catch-up payments from past underfunding and to lower-than-usual investment returns. However, the normal cost of benefits (the amount needed to fund current benefits rather than legacy costs associated with past benefits) declined as pension benefits for participants in the State Employee Retirement System were cut by roughly a fifth in the wake of the financial crisis (author’s analysis of Center for Retirement Research 2013). The weighted average employer normal cost for the State Employee Retirement System and the Municipal Employees Retirement System in Connecticut is currently around 8 percent of salary, though this will decline as older workers with more generous benefits retire (author’s analysis based on Buck Consultants 2012 and Cavanaugh Macdonald Consulting 2012).18 This exaggerates the current cost of public-sector pensions in Connecticut because it does not include participants in the less generous teachers’ pension plan who may not be in our full-year sample.19 Meanwhile, it includes the more generous pension of some hazardous duty personnel who are excluded from Biggs’s pay sample, something Biggs does not take into account. The normal cost is less than the BLS measure for public-sector pensions across the country not because Connecticut pensions are meager—though they are not particularly generous—but because the BLS measure includes catch-up payments. Instead of adjusting the pension cost downward, Biggs increases it to 23.5-53.2 percent of salary (Table 3 shows the lower of Biggs’s two estimates). This is his estimate of how much it would cost to fund accrued pension benefits if the rate of return on plan assets were 2.5 or 5.0 percent, lower than expected returns based on past experience. Biggs claims this is necessary because pension benefits are guaranteed and should be “discounted to the present at an interest rate commensurate with the risk of those benefits”—that is, using the interest rate on Treasury bonds and other safe investments rather than the expected rate of return on pension fund assets. However, the normal cost of pension benefits (and by extension the amount employers are supposed to contribute) is not based on the guaranteed benefits workers would be entitled to today if they left, but rather on estimates of how much accrued service credits will be worth at retirement based on employment and salary projections. Therefore, the projected rate of return is the appropriate rate to use to estimate the cost of these projected benefits (for a longer discussion of this issue, see GAO 2014; Morrissey 2011; Morrissey 2012). Biggs does not argue that the expected return on pension assets is 2.5 or 5.0 percent. Rather, this is his way of taking into account the investment risk borne by taxpayers, because the expected return on conservative investments is much lower and Biggs treats pension benefits as guaranteed. However, recent experience has shown that employment, salary, and cost-of-living adjustments factored into these estimates are not, as Biggs claims, guaranteed, as workers took the brunt of losses after the 2008 market downturn. Though pension benefit cuts fell hardest on newly hired public-sector workers, this does not meant that mid-career workers and retirees were left unscathed (Brainard and Brown 2015; Munnell et al. 2011). Thus, it is appropriate that the expected rate of return be used to estimate the expected cost of pensions, especially in states like Connecticut contending with large legacy costs after falling behind on pension payments (Aubry and Munnell 2015; Center for Retirement Research 2013). Unfortunately, it is more likely that Connecticut will attempt to further cut benefits even if rate-of-return and other actuarial assumptions are met than that the state will leave benefits intact if these assumptions turn out to be optimistic. While basing pension costs on expected rates of return does not take into account risk, the same is true of other estimates used in pay comparisons. For example, actuarial estimates of the present value of retiree health benefits do not take into account the risk borne by workers that these benefits may be cut. In addition, pensions are designed to promote employee retention of prime-age workers and orderly retirement, a significant indirect benefit to taxpayers also not factored into pay comparisons. BLS compensation statistics are for active employees and do not include retiree benefits that are not funded in advance, such as pensions. The most important of these is retiree health benefits, which are more common in the public sector. Nationwide, 69 percent of state government employers and 28 percent of private-sector employers with 200 or more workers offer some form of retiree health (Franzel and Brown 2013; McArdle, Neuman, and Huang 2014). An alternative measure is the estimated present value of future benefits accrued by current state employees, which was 13.6 percent for the 2013–14 fiscal year and 12.2 percent for the 2011–12 fiscal year (Segal Consulting 2014). The most recent estimate (13.6 percent) is the one Biggs cites in the text, though 15.5 percent is the number in his table (possibly in error). In theory, the present value of future benefits is a more appropriate measure than current outlays. However, such estimates are sensitive to assumptions, notable the pessimistic assumption that health cost inflation will be 5 to 7 percent per year, even though it has been below 5 percent in recent years (Peterson-Kaiser Health System Tracker 2016). The cost of these benefits also includes the higher cost of providing retiree health benefits to teachers and hazardous duty personnel who tend to retire at younger ages but are excluded from Biggs’s pay sample (Segal Consulting 2014). The EPI estimate in Table 3 follow Biggs’s lead in using the projected of retiree health cost rather than the current cost, but unlike Biggs, uses the 2011–12 fiscal year estimate in calculations for earlier years for which estimates are unavailable.21 In addition, as mentioned earlier, the EPI estimate lowers the cost of health insurance for active employees by 2.4 percentage points to avoid double counting the higher cost of including older participants in the risk pool, which is included in the normal cost estimate for retirees and also reflected in higher blended premiums paid on behalf of active workers. This 12.6 percent estimate almost certainly overstates the cost of public-sector retiree health benefits since it assumes that all local government workers receive benefits even though only unspecified “other” workers are mentioned in the actuarial valuation (Segal Consulting 2014). In addition, retiree health benefits are not guaranteed, and the shifting of health costs to workers and retirees already underway is likely to pick up if health cost inflation is as high as projected. Retiree health benefits were already reduced by around 10 percent in 2009 and 2011 (author’s analysis of Segal Consulting 2014). Even less information is available for the private sector, so it is necessary to rely on the aforementioned estimate that 28 percent of large private-sector employers currently offer these benefits. This is lower than the share of very large establishments offering these benefits but higher than the share of all private-sector workers receiving them (Fronstin and Adams 2012; McArdle, Neuman, and Huang 2014). 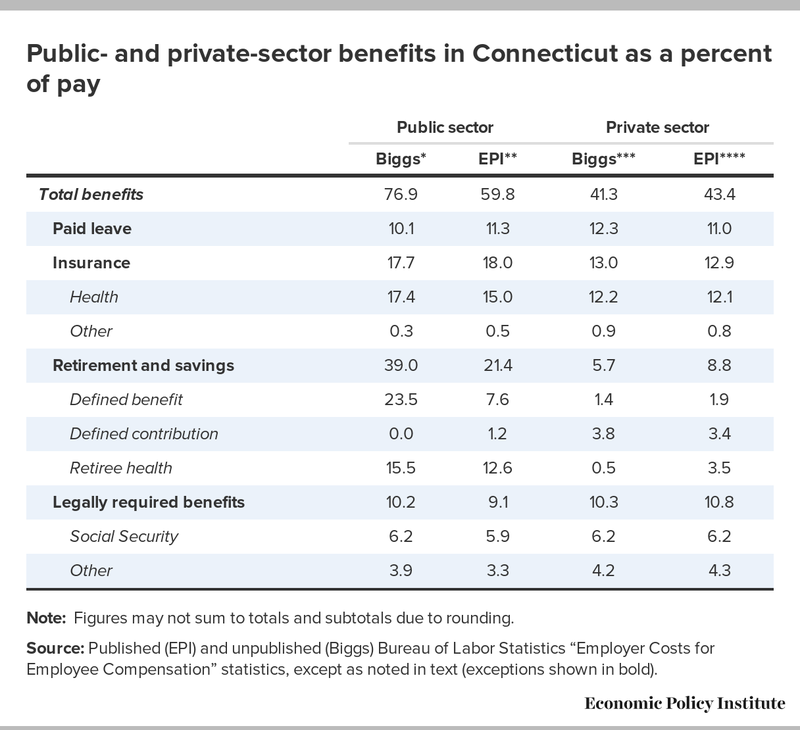 Andrew Biggs claims that public-sector workers in Connecticut are compensated 25–46 percent more than comparable private-sector workers. This is simply not correct. Biggs takes several steps to obtain his unexpected results. First, he chooses an unrepresentative sample of public-sector workers, excluding the two largest occupational groups—teachers and public safety officers—as well as all local government employees. He includes the higher benefits of these workers in some calculations while excluding their lower salaries from others. Next, Biggs uses nonstandard controls in his regression analysis, implicitly attributing pay differences to “human capital” that are just as likely to be due to discrimination, altruism, and other factors unrelated to potential productivity. While not as egregious as previous efforts, the results from his regression analysis remain unconvincing (see Morrissey 2012 for a critique of a Biggs study that omitted educational attainment from the model to minimize the pay gap between public- and private-sector workers). Finally, Biggs adds inflated estimates of the cost of public-sector pensions and retiree health benefits. A more careful analysis shows that wages and salaries are 14 to 16 percent lower on average for public-sector workers in Connecticut compared with similar workers employed by large private-sector firms in the state. Public-sector workers receive benefits worth approximately 16 percentage points more as a share of salary. Thus, compensation costs are roughly equal in the two sectors, though public-sector workers are likely to fall behind as older workers retire and are replaced by new hires who receive less generous benefits. The conventional wisdom about the sacrifices that teachers, police officers, firefighters, and other public-sector workers make is the reality in Connecticut and the rest of the country. Most public-sector workers are willing to work for less because they view public service as a vocation, not as a way to get rich. The national pattern that public-sector workers with college degrees are compensated somewhat less and those without college degrees are compensated somewhat more than their private-sector counterparts holds true for Connecticut as well. The more compressed pay structure—with top and bottom pay closer together—reflects the fact that people are drawn to public service for nonpecuniary reasons and that government employers have an interest in setting a higher floor on compensation than private-sector employers, some of whom pay poverty-level wages and pass health care and other costs onto government programs. Because public-sector workers are more likely to have college degrees, public employers—and taxpayers—are getting a bargain while ensuring a decent standard of living for less educated workers. With public-sector benefits already declining, there is no reason to “reform” these benefits to make public-sector pay competitive, as Biggs suggests. Such cuts would only make it harder to recruit educated workers while increasing outlays for state-funded safety net programs. There are, undoubtedly, some highly compensated public-sector employees listed on the Yankee Institute’s “ctsunlight.org” website. These are doctors and coaches who presumably would be highly paid in a private university system as well. The rationale for these coaches’ and doctors’ high pay is that it is offset by alumni donations, athletic program revenues, medical reimbursements, and the like. This theory is worth questioning, but it is no reason to cut the pensions of teachers, police, firefighters, bus drivers, home health aides, and school janitors. Monique Morrissey joined the Economic Policy Institute in 2006. Her areas of expertise include labor markets, retirement security, executive compensation, unions and collective bargaining, and financial markets. She previously worked at the AFL-CIO Office of Investment and the Financial Markets Center. She has a Ph.D. in economics from American University and a B.A. in political science and history from Swarthmore College. Omitted variable bias is a well-known topic covered in introductory econometrics courses.8 Less well understood is the fact that adding control variables can also bias results, even if done in an effort to reduce omitted variable bias. In a human capital model, the easiest way to understand this is to focus on a single characteristic, such as being female, that is positively correlated with public-sector employment and negatively correlated with pay. Unless female workers’ lower pay is entirely due to unobserved productivity differences, controlling for gender will shrink or even reverse the estimated pay penalty public-sector workers face compared with similarly skilled private-sector workers. To understand why, first imagine a simple scenario in which all workers have equal qualifications but women are paid less than men in both sectors due to discrimination. Assume, as well, that public-sector employers discriminate less in hiring, or that women simply prefer to work in public-sector occupations. In this case, the sector that employs more underpaid women—the public sector—pays less on average for equally qualified workers, but this advantage will not be apparent in a model that controls for gender. This simple example aside, the results do not depend on public employers engaging in pay discrimination as long as women are paid less in the overall sample. Nor does it matter whether women’s lower pay is due to discrimination or to other reasons unrelated to job skills, such as poor bargaining skills or a greater willingness to accept lower pay to pursue a public service vocation such as teaching. Estimates of the public-sector pay penalty will always shrink with the inclusion of a gender variable if women are a larger share of the public-sector workforce and women are paid less in the overall sample.9 This matters in the current context because women and African Americans are more likely to be employed in the public sector, where there is generally less discrimination than in the private sector (Cooper, Gable, and Austin 2012, Hiltonsmith 2016). This is not to deny that the lower pay of female and black workers may in part reflect unobserved differences in productivity or job difficulty and so including demographic control variables is an attempt to correct for omitted variable bias. For example, women are more likely to take time out of the labor force to raise children than men, so female workers’ lower pay may partly reflect larger gaps between actual work experience and standard estimates of experience based on age and education. Similarly, black workers and other members of discriminated-against and disadvantaged groups may have less work experience or poorer-quality educations that are not apparent in the data. This is why researchers often include standard demographic controls in pay comparisons—in an attempt to control for unobserved differences in skill or experience. However, the results should be interpreted with caution and treated as conservative estimates of pay gaps. Estimating the cost of public-sector retiree health benefits is even thornier than estimating the cost of pensions. Until recently, retiree health benefits were not considered an accounting liability because they are subject to reduction or elimination.22 Many states, including Connecticut, have implemented cuts to retiree health benefits in recent years (Franzel and Brown 2013; Segal Consulting 2014). Historically, retiree health costs were not funded in advance, though in the wake of new accounting standards some state and local governments are starting to build up funds for “Other Post-Employment Benefits (OPEBs),” as they are known (McNichol 2008). Outlays are not included in BLS measures of employer costs for employee compensation, which are based on costs for active employees. Further complicating the issue is the fact that the primary value of retiree health benefits is often not the amount directly spent on premiums by employers, if any, but rather the option provided to retirees of buying into a cheaper group plan rather than paying for individual coverage. Allowing former employees access to a group plan, whether through COBRA coverage or retiree health benefits, can confer a benefit to former employees at no direct cost to employers because group plans are more efficient and therefore cheaper than individual insurance. However, in the case of retiree benefits there is also an indirect cost to employers even when retirees pay the full cost of the premium if the premium is based on a blended rate rather than the higher cost of covering older participants. Thus, it is difficult to estimate the present cost of future retiree health benefits in either sector. However, it is likely that actuarial estimates extrapolating from past cost growth will overestimate future costs to employers, since unsustainable health cost inflation will be met with some combination of overall cost containment and cost shifting by employers. Thus, the present value of retiree health benefits, especially those provided by public employers, is likely to be overstated in both Biggs’s and this report. 1. Weeks worked include paid vacations. 2. Part-time and part-year workers represent a smaller share of total hours worked, but full-time-equivalent figures are not readily estimated using ACS data. 3. The salary gap is the percent by which teacher weekly wages lag those of comparable workers who are not teachers. The compensation gap is the percent by which teacher wages plus benefits lag those of comparable workers who are not teachers. 4. These are the occupations Biggs presumably drops from his sample: teachers (occupational codes 2200–2340); firefighters and supervisors of correctional officers, police, detectives and firefighters (3700–3740); bailiffs, correctional officers, jailers, detectives, criminal investigators, police officers, and miscellaneous law enforcement workers (3800–3850). It is possible Biggs also dropped other workers in “education, training, and library” and “protective service” occupations, such as librarians, teaching assistants, fire inspectors, animal control officers, lifeguards, and security guards. 5. The distinction between explanatory variables of interest and control variables is largely arbitrary—it depends on the researcher’s focus. Thus, for example, a regression model measuring the economic returns to education might include sector as a control variable if the researcher were interested in returns to education conditional on sector. 6. Since actual work experience is generally not known, potential experience is conventionally estimated as age minus years of education minus six years (or age minus 18 if the first yields a negative number). 7. Biggs adjusts for hours worked first by excluding workers who work less than 35 hours per week, then adding a control variable for weekly hours in a model measuring the percentage change in annual earnings—that is, where the dependent variable is the natural logarithm of annual earnings. Arguably, it would be better to use a measure of hourly pay to begin with and not exclude part-time workers, but Biggs’s approach is used throughout this report. 8. A classic example is measuring the returns to a college education without factoring in differences in aptitude between students who go on to college and those who do not. Though the college pay premium may be of interest regardless of underlying factors, if the results are meant to be interpreted as the labor market value of obtaining a college degree, then a model that does not account for differences in test scores or grades between students who go on to college and those who do not will exaggerate the value of obtaining a degree. Ideally, the model should also account for the advantages of coming from a better-off family, since this is a larger factor than test scores in college entry, though this is rarely if ever done (Fox, Connelly, and Snyder 2005). 9. For example, let us assume that 20 percent of workers are employed in the public sector, 60 percent of private-sector workers are male, 60 percent of public-sector workers are female, and all workers are equally productive. Let us also assume that private-sector male workers earn $100,000, private-sector female workers earn $90,000, and public-sector workers (male or female) earn $80,000. In this case, average private-sector pay is $96,000 and average public-sector pay is $80,000, 20 percent less than public-sector pay. However, a regression that includes a gender control will find that the public-sector pay gap is only around 16 percent. 10. For example, over a quarter of Connecticut public-sector workers have education degrees, which for obvious reasons are much less common among private-sector workers. Controlling for having an education degree probably does not have much of an effect on Biggs’s estimates since he excludes teachers from his sample, but this should be kept in mind when Biggs’s model is applied to a broader sample later in this report. 11. The efficiency wage hypothesis in labor economics posits that some employers may pay their employees more than the market wage in order to increase their productivity or reduce costs associated with turnover. 12. Ignoring, for simplicity, differences in education, experience, and other variables, the situation can be simplified to two simultaneously determined structural equations. In the first, the probability of someone living in a low-cost neighborhood is determined by their pay and whether they lived in a low-cost neighborhood previously. In the second, pay is determined by whether someone lives in a low-cost neighborhood (where the cost of living is lower) and whether they are employed in the public sector. If the second equation is estimated by itself, the coefficient on the public-sector term will be divided by (1-α1α2) where α1 is the coefficient from the first structural equation that measures the positive effect of previously living in a low-cost neighborhood on the probability of currently living in one, and α2 is the coefficient from the second structural equation measuring the negative effect of living in a low-cost neighborhood on pay (see Wooldridge 2000, Section 16.2). Since α2 is negative, the term in parentheses is greater than 1 and the effect will be to shrink the estimated public-sector pay gap. While this is a simplified model and simultaneity bias is more difficult to predict than omitted variable bias, it is possible to determine the effect of adding control variables through trial and error. 13. As in all the regressions, there is a standard quadratic term (“experience squared”) to allow for diminishing returns to experience. 14. EPI’s 5.1 percent estimate is based on running a version of the second regression model (“with demographic controls”) on private-sector workers in Connecticut using Current Population Survey data and adding a variable for firm size. The results show that workers working for large (100 or more employees) private-sector firms are paid 16.6 percent more on average than those working for smaller private-sector firms. Workers with small and large employers are 34 and 66 percent of the sample, respectively, so the adjustment factor is 1/((.34/1.166)+.66) ≈ 105.1 percent. 15. Supplemental pay includes overtime and premium pay, shift differentials, and nonproduction bonuses. 16. The 86 percent adjustment factor was based on an estimated ratio of 23 pre-Medicare-eligible retirees per 100 active participants and 87 percent higher costs for pre-Medicare-eligible retirees: (100+23)/(100+(187 percent x 23))=86 percent. Multiplied by a premium cost equal to 17.4 percent of salaries, the adjustment factor reduces the estimated cost of health benefits for active employees to 15.0 percent. The ratio of retired to active participants was estimated based on Segal Consulting (2014). The share of state and local government retirees in Connecticut not yet eligible for Medicare in 2009–13 was based on the author’s analysis of IPUMS-CPS data. The higher cost for pre-Medicare-eligible retirees was based on premiums in Louisiana designed to cover the higher cost of retirees, as cited in Pew Charitable Trusts and MacArthur Foundation (2014). The ratio of dependents in each age group was assumed equal to the ratio of pre-Medicare-eligible retirees and active workers, which may be a conservative assumption because working-age spouses are more likely to be covered by their own employers and because retirees are older on average than their spouses and more likely to be eligible for Medicare. On the other hand, the extent to which active participants subsidize retirees may be overstated if families do not bear the full cost of covering children. 17. Traditional “defined-benefit” (DB) pensions provide monthly benefits upon retirement using a formula typically based on the employee’s earnings history, years of service, and age. DB pensions were once the most common type of retirement plan in both the public and private sectors but have been largely replaced in the private sector by 401(k)s and other “defined-contribution” (DC) plans. Public-sector participants in DB pensions typically shoulder some of the cost, in contrast to private-sector participants in these pensions. In DC plans, participation is voluntary, and the benefit typically takes the form of an employer matching contribution to a savings plan (contingent on workers contributing themselves) rather than a guaranteed benefit at retirement. 18. Biggs uses the latest actuarial valuation (Cavanaugh Macdonald Consulting 2014) but the employer normal cost is not much different at around 8 percent. 19. Teachers’ pensions are less generous due to higher employee contributions, not necessarily lower benefits. 20. This assumes municipal employees do not receive retiree health benefits, since no such benefits were mentioned in a 2010 report of the Connecticut State Post-Employment Benefits Commission that included municipal employees in its analysis of pension benefits (2010). 21. Specifically, we assume that the cost in 2012 was 12.9 percent (average of 13.6 and 12.2 percent) and the cost in 2009–2011 was 12.2 percent. 22. Some benefits are protected in the short term by collective bargaining agreements. Allegretto, Sylvia, and Lawrence Mishel. 2016. The Teacher Pay Gap Is Wider Than Ever—Teachers’ Pay Continues to Fall Further Behind Pay of Comparable Workers. Economic Policy Institute report. Angrist, Joshua D., and Jörn-Steffen Pischke. 2009. Mostly Harmless Econometrics: An Empiricist’s Companion. Princeton, N.J.: Princeton University Press. Aubry, Jean-Pierre, and Alicia H. Munnell. 2015. Final Report on Connecticut’s State Employees Retirement System and Teachers’ Retirement System. Center for Retirement Research at Boston College report. Bender, Keith A., and John S. Heywood. 2010. Out of Balance: Comparing Public and Private Sector Compensation over 20 Years. Center for State and Local Governance Excellence and the National Institute on Retirement Security report. Biggs, Andrew. 2015. Unequal Pay: Public vs. 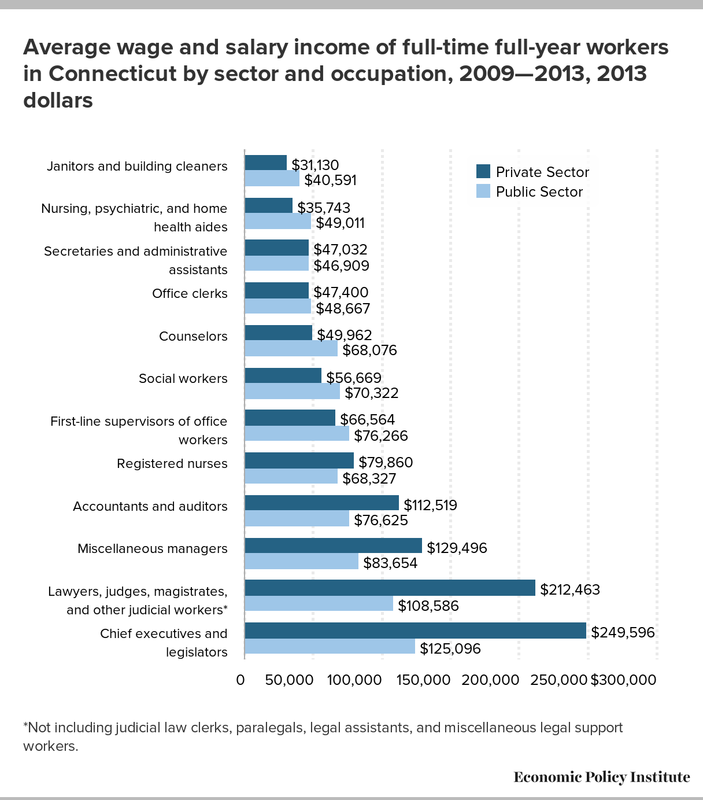 Private Sector Compensation in Connecticut. Yankee Institute for Public Policy report. Brainard, Keith, and Alex Brown. 2016. The Annual Required Contribution Experience of State Retirement Plans, FY 01 to FY 13. National Association of State Retirement Administrators report. Buck Consultants. 2012. Report on the Biennial Valuation of the Connecticut Municipal Employees Retirement System Prepared as of July 1, 2012. Bureau of Labor Statistics (BLS). 2010–2014. “Employer Costs for Employee Compensation News Releases” (annual news releases covering December 2009 to December 2013 data). Cavanaugh Macdonald Consulting. 2012. Connecticut State Employees Retirement System—Report of the Actuary on the Valuation as of June 30, 2012. Cavanaugh Macdonald Consulting. 2014. Connecticut State Employees Retirement System—Report of the Actuary on the Valuation as of June 30, 2014. Center for Retirement Research. 2013. “The State of Connecticut,” February. Cooper, David, Mary Gable, and Algernon Austin. 2012. The Public-sector Jobs Crisis: Women and African Americans Hit Hardest by Job Losses in State and Local Governments. Economic Policy Institute report. Dube, Arindrajit, Ethan Kaplan, and Owen Thompson. 2014. Nurse Unions and Patient Outcomes. IZA Discussion Paper No. 8259. Fox, M. A., B. A. Connolly, and T. D. Snyder. 2005. Youth Indicators 2005: Trends in the Well-Being of American Youth. U.S. Department of Education. National Center for Education Statistics. Table 21. Franzel, Joshua, and Alex Brown. 2013. Spotlight on Retiree Health Care Benefits for State Employees in 2013. National Association of State Retirement Administrators report. Fronstin, Paul, and Nevin Adams. 2012. Employment-Based Retiree Health Benefits: Trends in Access and Coverage, 1997‒2010. Employee Benefit Research Institute Issue Brief No. 377. Gould, Elise, Jessica Schieder, and Kathleen Geier. 2016. What Is the Gender Pay Gap and Is It Real? The Complete Guide to How Women Are Paid Less Than Men and Why It Can’t Be Explained Away. Economic Policy Institute report. Hiltonsmith, Robert. 2016. Twin Threats: How Disappearing Public Pensions Hurt Black Workers. Demos report. Keefe, Jeffrey H. 2010. Debunking the Myth of Overcompensated Public Employees. Economic Policy Institute Briefing Paper #276. Lemieux, Thomas. 2006. “The ‘Mincer Equation’ Thirty Years after Schooling, Experience, and Earnings.” In Jacob Mincer—a Pioneer of Modern Labor Economics. Shoshana Grossbard, ed. New York: Springer. McArdle, Frank, Tricia Neuman, and Jennifer Huang. 2014. Retiree Health Benefits at the Crossroads. Kaiser Family Foundation. McNichol, Elizabeth. 2008. Accounting for the Cost of Retiree Health and Other Benefits (GASB 45). Center on Budget and Policy Priorities report. McNichol, Elizabeth. 2012. Some Basic Facts on State and Local Government Workers. Center on Budget and Policy Priorities report. Milliman. 2016. Milliman 2016 Pension Funding Study. Morrissey, Monique. 2011. Discounting Public Pensions: Reports of Trillions in Shortfalls Ignore Expected Returns on Assets. Economic Policy Institute report. Morrissey, Monique. 2012. Do Public School Teachers Really Receive Lavish Benefits? Economic Policy Institute report. Morrissey, Monique. 2015. Will Switching Government Workers to Account-type Plans Save Taxpayers Money? Economic Policy Institute report. Munnell, Alicia H., Jean-Pierre Aubry, Anek Belbase, and Joshua Hurwitz. 2013. State and Local Pension Costs: Pre-Crisis, Post-Crisis, and Post-Reform. Center for Retirement Research report. Munnell, Alicia H., Jean-Pierre Aubry, Josh Hurwitz, and Laura Quinby. 2011. Comparing Compensation: State-local versus Private Sector Workers. Center for Retirement Research report. Nuschler, Dawn, Alison M. Shelton, and John J. Topoleski. 2011. Social Security: Mandatory Coverage of New State and Local Government Employees. U.S. Congressional Research Service report. Pew Charitable Trusts. 2016. State Retiree Health Care Liabilities—Multiple Factors Contribute to Improving Picture in Many States. Pew Charitable Trusts and Macarthur Foundation. 2014. State Employee Health Plan Spending—An Examination of Premiums, Cost Drivers, and Policy Approaches. Richwine, Jason and Andrew Biggs. 2014. Overpaid or Underpaid? A State-by-State Ranking of Public-Employee Compensation. American Enterprise Institute Working Paper Series, April 24. Schmitt, John. 2010. The Wage Penalty for State and Local Government Employees. Center for Economic and Policy Research report. Segal Consulting. 2014. State of Connecticut Other Post-Employment Benefits Program—Actuarial Valuation and Review of Other Postemployment Benefits (OPEB) as of June 30, 2013 In accordance with GASB Statements No. 43 and No. 45. U.S. Census Bureau. 2013. Census of Governments: Finance—Surveys of State and Local Government Finances. U.S. Government Accountability Office (GAO). 2014. Pension Plan Valuation—Views on Using Multiple Measures to Offer a More Complete Financial Picture. Wooldridge, Jeffrey M. 2000. Introductory Econometrics—A Modern Approach. Cincinnati, Ohio: South-Western College Publishing.